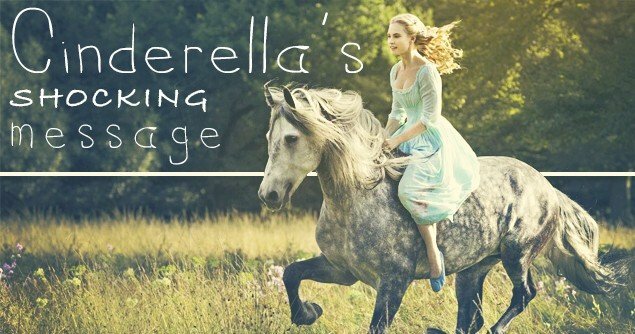 Cinderella Has a Message for Girls that Might Shock You! Since Cinderella’s big screen debut in 1950, this beloved princess has consistently entertained audiences of all ages through various adaptations of the classic fairy tale. Her latest reemergence raises the question: Does she really have a place in 2015 filmdom, waltzing across an exquisite ballroom, hand in hand with a charismatic, perfectly coiffed Prince Charming, while Katniss and Tris duke it out with hybridized monsters and cold-blooded villains – by themselves – in the theater next door? Hasn’t our culture grown out of princesses and happily ever after’s already? I recently went to Disney World with my family, and I must tell you that I was amazed by the throngs of little girls I saw who were dressed up, from glitter-doused head to sparkling toe, like their favorite Disney princesses. All around me, miniature Jasmine, Belle, and Ariel lookalikes stood in awe before the towering princess castles and watched with glee as their grown-up counterparts waved at them from atop lofty, larger-than-life parade floats. What was fascinating to me was the realization that these petite princesses weren’t born to 1950s and ‘60s June Cleaver-type housewives, but to educated, often high-ranking professional women. I would be willing to wager that many of the moms walking around with second-hand sparkles on their faces and clothes were doctors, lawyers, engineers, business owners, etc. – women who have benefited from and likely celebrate the liberating aspects of feminism, but simultaneously find no contradiction in embracing the poofy dresses, tiaras, and sheer girliness that mesmerize their daughters. The enduring popularity of princesses and the unparalleled frenzy over fairy tales seem to indicate that Cinderella indeed does have a place on movie marquees, not to mention in hearts of little girls with big dreams. If you watch the trailer for the new CINDERELLA movie, you will hear Cinderella’s mother tell her, “I want to tell you a secret that will see you through all the trials that life can offer: Have courage, and be kind.” Cinderella, as you know, was a young girl whose life was fraught with trials. She lost her mother at an early age. A year later, her father married a cruel woman with two equally nasty daughters of her own who forced Cinderella to be their servant. Each night after her chores, she would retire to a cold dank room and seek warmth from the fireplace, the cinders of which inspired her derisive nickname. When the Prince announced that he was hosting a ball in hopes of finding a wife there, Cinderella was left out, having been told by her stepsisters that maids were not invited. Despite the abuse, Cinderella continued to abide by her mother’s advice, which, in both the modern movie and the 18th-century story, was to be kind. While Cinderella may not be a superb archer like Katniss Everdeen, nor a skilled fighter like Tris Prior, she is undoubtedly a heroine in her own right, one who exemplifies the kind of inner strength that can survive and thrive long after manmade weapons have tarnished and physical vigor has given out. Cinderella’s devotion to goodness, in fact, is a virtue on which the Bible often teaches, such as in the timeless Old Testament stories of Ruth and Queen Esther. Both Ruth and Esther were women whose strength came not from their rejection of a man’s assistance and their dogged adherence to a humanistic, I-can-do-this philosophy, but from the integrity of their character and a commitment to righteousness that was never compromised, no matter how bleak their circumstances became. Ruth, for instance, remained loyal to her hopeless and despondent mother-in-law Naomi after each of their husbands died and worked diligently to provide for both of them. Her faithfulness and good-heartedness won the favor of Boaz, the owner of the field from which she was gleaning. He took notice not of her appearance or possessions – she had very little– but of “all that [she had] done for [her] mother-in-law after the death of [her] husband” (Ruth 2:11, NASB). Like Prince Charming, Boaz was less interested in external beauty and talent and more interested in the strength and kindness that issued from her heart. Queen Esther, another Old Testament heroine, was an incredible woman of courage who used her lot in life, much like Ruth and Cinderella, to bless others, even if meant endangering herself. Like Cinderella, it was during a pageant that she was plucked from obscurity and transformed into royalty. Also like her folkloric counterpart, Esther put others’ needs before her own; she risked her own neck by boldly confronting her husband Xerxes, the Persian king, an act that ultimately saved the Jewish people from annihilation in 539 B.C. One might argue that Cinderella and her biblical forebears, Ruth and Esther, all needed men to come whisk them away from their plight, but this simply isn’t true. Their dreams and aspirations far exceeded any longing for a husband. Cinderella desired freedom. Ruth aspired to support her despairing mother-in-law and save what was left of their devastated family. When she became privy to a plot hatched to destroy her people, Esther’s goal was to intercede on their behalf; she couldn’t have cared less about what Xerxes might do to her afterward. God’s plan has never been for women to be passive, voiceless and dependent. Rather, His purpose in uniting men and women in marriage is so that husbands and wives can be one another’s helpers, companions, and sources of comfort and strength, second only to Christ. Additionally, Christ-centered marriages create stable homes in which children can develop and thrive. At its deepest level, marriage reflects the covenant relationship between Christ the Groom and the Church, His Bride. When we consider that Christ, our Bridegroom, sacrificed Himself to make us holy, “cleansing [us] by the washing with water through the word” and that an official wedding feast will occur after His return – His return on a white horse, I might add! – we see that in fact, Jesus is the ultimate Prince Charming, if you will. (Eph. 5:25-26; Rev. 19:9; Rev. 19:11). It follows then that we the Bride, arrayed in “fine linen, bright and clean,” compose the ultimate Cinderella (Rev. 19:8). For those of you who have been among the Bride of Christ for any length of time, you know that it takes grit, strength, self-control, and a myriad of other fruits of the Spirit that can be cultivated only through the Holy Spirit dwelling within us. When the wicked stepmothers and mocking stepsisters of life do their worst, we do not retaliate or seek vengeance. No, we “turn the other cheek” and “return evil with a blessing,” just as the Bible teaches and the story of Cinderella illustrates (Matt. 5:39; 1 Peter 3:9). One of the producers of the upcoming CINDERELLA movie, Allison Shearmur, who also worked on THE HUNGER GAMES, said Disney was keen to present a “strong and contemporary” heroine for girls around the world. Read more from the filmmakers here. Though she may appear dainty and a little too froufrou for some people’s taste, Cinderella is a princess little girls can learn from and look up to. And for those women reading this who do enjoy the frills of femininity (I am one of them! ), Cinderella proves that you can still be a rock star without hanging up your heels…er…slippers. CINDERELLA hits theaters this Friday. Diana Anderson-Tyler is the author of two Faith and Fitness books and she is a co-owner and coach at CrossFit 925. Diana can be found on Twitter here.